Seniors are increasingly enjoying travel and there’s no better or affordable way to explore local attractions and venues than by chartering bus services with us! Whether it’s a day trip to the show; a seniors group tour; shopping mall sponsored senior’s shuttle busing; or essential transportation services for medical appointments; you can trust us to meet all your transportation needs. 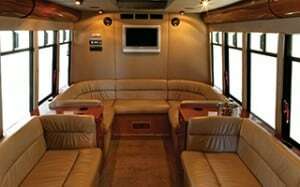 Choose from basic budget friendly buses to ultra comfortable coach style buses suitable for sight-seeing tours. We understand that some passengers have special needs when being transported. We can provide wheelchair accessible transportation and air conditioned buses so the entire group can participate. View and choose from our available bus types here! • Low Cost, Superior Quality. We understand that often seniors group busing is organized by not-for-profits and with us, you get some of the lowest per passenger costs available. The quality of our fleet, yet more importantly of our people, is excellent. Our drivers are more than fully trained; they’re extremely caring and have the full backup support of our local dispatch and management teams. Help is always a radio call away. • Passenger Load Flexibility. Whether your seniors’ group busing needs calls for a mini bus or a several large buses, we can scale services to meet you needs. Charter buses as needed! • Safety & Trust. We’re trusted by school districts to transport thousands of kids daily. Your seniors group will be in caring hands focused on safety and security. • Insured – We are fully insured thus allowing you to focus on you’re the trip, not the details. • Ready Drivers – With hundreds of fully trained drivers, we’re always ready. Trust the professionals to take care of your seniors group. Our bus rental services extend across most of the Southern Ontario, including; Greater Toronto, Mississauga, Brampton, Etobicoke, Markham, North York, Oakville, Burlington, Windsor-Essex County and Bradford-Simcoe County. For seniors’ transportation services in your area, please submit the online charter request form or call us today!